Regular readers and members of our iPad Flickr group may already be familiar with Susan Murtaugh's inspirational and truly impressive iPad art, we are big fans of her work here. Suzi began a particularly challenging project a few days ago. From 21st October Suzi and 6 other (non-iPad) artists will be producing one painting each day for 30 days. 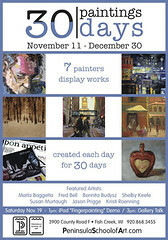 The paintings will be exhibited in a show at the Peninsula Art School in Fish Creek, Wisconsin running from 11th November to 30th December this year. Suzi will be the first iPad artist to exhibit in this gallery and her paintings will be printed onto archival paper and exhibited alongside the other artists' work. Suzi's hard work will culminate in a special iPad Fingerpainting Demo on 19th November when she will paint the last of her 30 images in front of an audience. We are sure that, like us, you will blown away by Suzi's talent and wish her all the best in completing this challenge. You can follow Suzi's Flickr stream to see her paintings as she posts them and keep up with her progress on the 30 paintings in 30 days challenge, we're sure she would appreciate your encouraging comments too. Below we have included Suzi's first 2 iPad paintings to whet your appetite. They are beautifully painted and detailed as always and we are loving the 'hidden' numbering too. If you are able to make it along to the Peninsula Art School to see the exhibition, especially if you attend Suzi's Fingerpainting Demo on the 19th, we would love to hear what you thought in the comments.